Sunday February 25th 1894 We were late getting up this morning and did not go to church. Will went out west of town to see a man and I went over home and with Josies help got their things ready in the garret. We spent the afternoon getting things picked up about the house. Lee came in to supper with us. I went to church in the evening. Will was lame and did not go. Mr Edwards spent the evening with him. 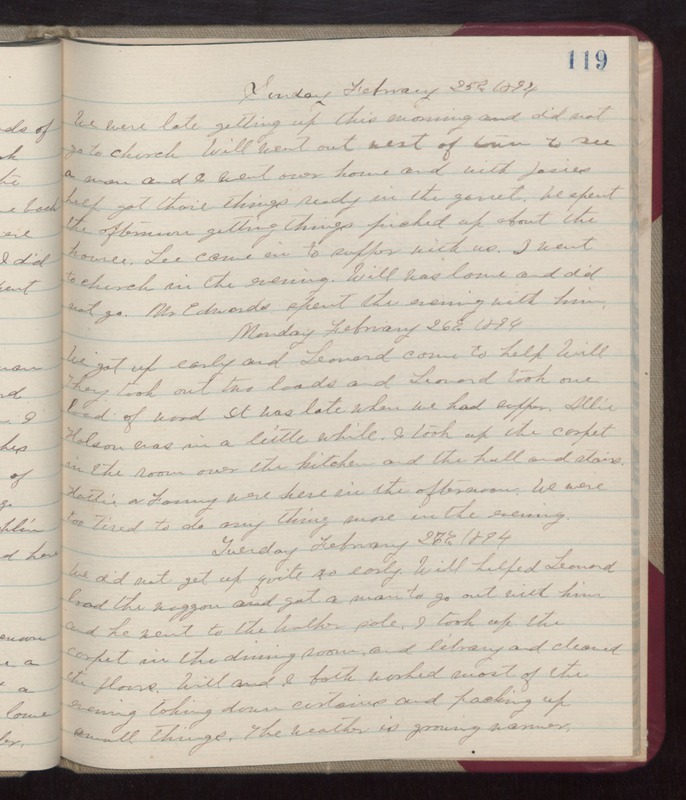 Monday February 26th 1894 We got up early and Leonard came to help Will. They took out two loads and Leonard took one load of wood. It was late when we had supper. Allie Holson was in a little while. I took up the carpet in the room over the kitchen and the hall and stairs. Hattie & Fanny were here in the afternoon. We were too tired to do any thing more in the evening. Tuesday February 27th 1894 We did not get up quite so early. Will helped Leonard load the waggon and got a man to go out with him and he went to the Walker sale. I took up the carpet in the dining room, and library and cleaned the floors. Will and I both worked most of the evening taking down curtains and packing up small things. The weather is growing warmer.